The objective of this report is to describe the protocols to derive the retinal pigment epithelium (RPE) from induced pluripotent stem (iPS) cells using different sizes of embryoid bodies. Muñiz, A., Ramesh, K. R., Greene, W. A., Choi, J. H., Wang, H. C. Deriving Retinal Pigment Epithelium (RPE) from Induced Pluripotent Stem (iPS) Cells by Different Sizes of Embryoid Bodies. J. Vis. Exp. (96), e52262, doi:10.3791/52262 (2015). Pluripotent stem cells possess the ability to proliferate indefinitely and to differentiate into almost any cell type. Additionally, the development of techniques to reprogram somatic cells into induced pluripotent stem (iPS) cells has generated interest and excitement towards the possibility of customized personal regenerative medicine. However, the efficiency of stem cell differentiation towards a desired lineage remains low. The purpose of this study is to describe a protocol to derive retinal pigment epithelium (RPE) from iPS cells (iPS-RPE) by applying a tissue engineering approach to generate homogenous populations of embryoid bodies (EBs), a common intermediate during in vitro differentiation. The protocol applies the formation of specific size of EBs using microwell plate technology. The methods for identifying protein and gene markers of RPE by immunocytochemistry and reverse-transcription polymerase chain reaction (RT-PCR) are also explained. Finally, the efficiency of differentiation in different sizes of EBs monitored by fluorescence-activated cell sorting (FACS) analysis of RPE markers is described. These techniques will facilitate the differentiation of iPS cells into RPE for future applications. Induced pluripotent stem (iPS) cells are a type of pluripotent stem cell derived by reprogramming adult cells with extrinsic factors1. In contrast, embryonic stem cells (ESCs), another type of pluripotent stem cell, are generated from the inner cell mass of the blastocyst2-3. Despite their different origins, iPS cells and ESCs are comparable in their unlimited capacity to replicate in vitro and in their capacity to differentiate into any cell type4-5. These characteristics of iPS cells make them ideal candidates for applications in personalized regenerative medicine. Recent research efforts are focused on developing robust differentiation protocols for producing specialized adult cells including retinal pigment epithelium (RPE)6-11. For potential clinical applications of iPS derived cells, a directed differentiation for that specific cell type is essential. There are various methods published for directed differentiation of both ESCs and iPS cells into RPE that varies greatly in their efficiency6-7, 12-16. We still do not know many of the molecular events that govern the cell/tissue fate during development or differentiation. In recent years, efforts have been made to develop the differentiation protocol that can mimic the embryological development as much as possible. During the blastocyst phase, uncommitted population of stem cells are together in a three dimensional microenvironment. So, various strategies were applied to make the ESC/iPS cells assembled together and grow them in three dimensions. These stem cell aggregates are called embryoid bodies (EBs). Studies have shown that EB differentiation of stem cells mimic early stage of embryo development and can spontaneously give rise to primitive endoderm on its exterior surface. Later, as EB development progresses, differentiated cell phenotypes of all three germ lineages appear17-18. Therefore, EBs based differentiation protocols have attracted a lot of attention for in vitro differentiation of ESC/iPS cells and are a good candidate for RPE generation from pluripotent stem cells13. EBs can be made using several methods from ESC/iPS cells. Initially, EBs were made by scraping off adherent colonies and maintaining them in non-adherent suspension culture. However, this approach yields heterogeneous population of EBs that causes low reproducibility. Hanging drop cell culture and microwell based EBs formation are other popular techniques for EBs formation which yield homogenous EBs of defined sizes that are highly reproducible. Furthermore, the microwell technique can yield large number of aggregates with less effort. Differentiation of cells within EBs is regulated by a multiplex of morphogenic cues from the extracellular and intracellular microenvironment. In contrast to differentiation in a monolayer format, EBs provide a platform for complex assembly of cells and intercellular signaling to occur17. Interestingly, the number of pluripotent stem cells used to make individual EBs was observed to influence the fate of cells. For example, in a hematopoietic differentiation study of human ESCs, it was observed that 500-cell EB promoted differentiation towards myeloid lineage whereas 1,000-cell EB pushed towards erythroid lineage20. In another study, smaller EBs favored endoderm differentiation whereas larger EBs promoted towards neuro-ectoderm differentiation11, 17. These past studies strongly suggest that the number of ESC/iPS cells used to make individual EBs affect the EBs based differentiation to any cell types. However, to our knowledge, there are no current studies that have elucidated the impact of EBs size in its propensity to differentiate towards RPE. The goal of this study is to characterize the influence of EB size on induced pluripotent stem (iPS) cells - retinal pigment epithelium (iPS-RPE) differentiation and to identify the optimum cell number to make the EBs for directed differentiation towards RPE lineage. Prepare feeder-free stem cell culture medium by adding 100 ml of 5x serum-free supplement to 400 ml of stem cell basal medium. The medium is stable at 4 °C for up to 2 weeks and at -20 °C for 6 months. Add 10 µM solution of rho-associated, coiled-coil containing protein kinase (Rock) inhibitor (Y-27362) to commercially available embryoid body (EB) formation medium. Prepare differentiation medium by adding 0.1 mM β-mercaptoethanol, 0.1 mM nonessential amino acids, 2 mM L-glutamine, 10% knockout serum replacement (KSR) and 10 µg/ml gentamicin to Dulbecco's Modified Eagle Medium/Nutrient Mixture F-12 (DMEM/F12). Prepare iPS-RPE medium by adding 1x N1 supplement, 0.1 mM nonessential amino acids, 250 µg/ml taurine, 13 ng/ml triiodo-L-thyronine sodium salt, 20 ng/ml hydrocortisone, 5 µg/ml gentamicin, and 15% Fetal bovine serum (FBS) 21 to Minimum Essential Medium Eagle (MEM). Adjust the pH to 7.4. Prepare triiodo-L-thyronine sodium salt stock solution. Dissolve 1 mg of triiodo-L-thyronine sodium salt in 1 N sodium hydroxide by gently swirling. Add 49 ml of MEM to make 50 ml of 20 µg/ml of triiodo-L-thyronine sodium salt. Prepare aliquots and freeze at -20 °C until needed. Use appropriate volume to achieve desired concentration in final culture medium. Prepare hydrocortisone stock solution. Solubilize 1 mg of hydrocortisone in 1 ml of 100% ethanol by gentle agitation. Add 19 ml of MEM to make 20 ml of 50 µg/ml hydrocortisone stock solution. Aliquot and freeze at -20 °C until needed. Use appropriate volume to achieve the desired concentration in the final culture medium. Prepare a working solution of dispase of 1 mg/ml in DMEM/F12. Prepare protein matrix extracted from Engelbreth-Holm-Swarm (EHS) mouse sarcoma cells in DMEM/F12 to 0.08 mg/ml. Coat each well of a 6-well plate with 1 ml of the matrix solution. Incubate the coated plates at RT for 1 hr. After the 1 hr incubation, aspirate the excess DMEM/F12. Add 0.5 ml of feeder-free stem cell culture medium to prevent drying of the wells. The matrix coated plates are ready for use. Prepare microwell plates, by rinsing each well with 2 ml of DMEM/F12. Remove DMEM/F12 and add 0.5 ml of EB formation medium supplemented with Rock inhibitor to each well. Centrifuge the plate at 2,000 x g for 5 min to remove any air bubbles. Prepare FACS staining buffer by mixing 2% FBS, and 0.09% sodium azide in phosphate buffered saline (PBS). Adjust the buffer to pH 7.4. Prepare trypsin neutralizing solution by adding 10% FBS to DMEM/F12. Prior to iPS cell seeding, warm feeder-free stem cell culture medium to 37 °C, and have the matrix coated plates ready. Quickly thaw the IMR90-1 iPS cells in a 37 °C water bath. Then remove the cryo-vial from the water bath and wipe the vial with 70% ethanol. Transfer the cells to a 15 ml conical tube using a 2 ml pipette to minimize breaking of cell clumps. Add 5 ml of warm feeder-free stem cell culture medium to the cells dropwise and gently mix. Centrifuge the cells at 300 x g for 5 min at RT and remove the supernatant. Carefully resuspend the cell clumps in 2 ml of feeder-free stem cell culture medium and seed the cell clumps in the wells of matrix-coated plate. Place the plate into a 37 °C incubator with 5% CO2, 95% humidity. Change the iPS cell culture medium daily. Observe undifferentiated colonies five to seven days after seeding. Check for undifferentiated colonies that are ready for passage (colonies with a dense center) under a light microscope. Prior to beginning to passage the iPS cells, warm the dispase solution, DMEM/F12 and feeder-free stem cell culture medium to 37 °C in water bath. Before passaging iPS cells, remove any areas of differentiation by scraping the area and aspirating the medium. Carefully rinse the iPS cells with 2 ml DMEM/F12. Add 1 ml of 1 mg/ml dispase to each well and incubate at 37 °C for 7 min. Aspirate the dispase and gently rinse the cell colonies with 2 ml of DMEM/F12 two times. After rinsing, add 2 ml of feeder-free stem cell culture medium to each well. Using a 5 ml pipette gently scrape the colonies of the plate to form cell clumps. Transfer the detached cell clumps to a 15 ml conical tube. Add sufficient feeder-free stem cell culture medium to seed the next passage of cells. Remove the medium from the iPS cells and rinse the iPS cells with 2 ml of DMEM/F12. Add 750 µl of accutase to iPS cells at each well of the 6-well plate. Incubate the cells at 37 °C and 5% CO2 to allow the cells to detach from the plate (approximately 5-10 min). Use a pipette to gently dissociate any remaining cells and to detach any remaining cells on the plate surface. Transfer the cells to a 50 ml conical tube. Rinse the plate with 5 ml of DMEM/F12 and combine the rinsed DMEM/F12 with the cells in the conical tube. Pass the cell suspension through a 40 µm cell strainer to remove any possible residual cell clumps. Centrifuge the cells at 300 x g for 5 min at RT to remove the accutase. Resuspend the cell pellet in EB formation medium so that the cell concentration is approximately 0.5-1.0 x 107 cells/ml. Determine the number of viable cells by counting the cells with Trypan Blue and a hemocytometer. Adjust the number of cells to each well of the microwell plate to generate the desired EB sizes. Add cells to the microwells of the plates prepared in step 1.9, Evenly distribute the cells by gently pipetting the cells several times. NOTE: Number of cells required per well = desired number of cells per EB x number of microwells per well. Adjust the EB formation medium supplemented with Rock inhibitor in the wells to a final volume of 2.0 ml. Redistribute the cells by gently pipetting each well. Centrifuge the microwell plates at 100 x g for 3 min. Place the plates in an incubator at 37 °C with 5% CO2 and 95% humidity for 24 hr. Harvest EBs from microwells by pipetting medium in the well up and down with a 1 ml micropipettor to remove most of the EBs. Pass the EB suspension through an inverted 40 µm cell strainer on top of a 50 ml conical tube to remove single cells. Wash the microwell plate 5 times with 1 ml of DMEM/F12 to remove all the EBs. Collect washes and pass over the inverted cell strainer. Turn the cell strainer right-side up to a new 50 ml conical tube. Collect the EBs by washing with EB formation medium. Count EBs to determine the yield. Plate the EBs on protein matrix coated six well plates (as in step 1.8.1) at a density of < 1,000 EBs/well in EB formation medium plus 10 µM Rock inhibitor. Incubate the EBs at 37 °C with 5% CO2 and 95% humidity for 24 hr. 24 hr after EB plating, replace with differentiation medium to initiate differentiation. Change half of the differentiation medium every other day until the cells are collected for further analysis. Collect samples at day 6, 17, 29 and 60 to conduct RT-PCR, immunocytochemistry and FACS to validate expression of characteristic RPE genes and proteins. Extract RNA from the EB samples according to instructions provided in the commercially available kit. Determine RNA concentration by using a spectrophotometer. Perform reverse transcription on 100 ng of total RNA according to commercially available RNA to cDNA reverse transcript kit. Perform PCR with 10 ng of cDNA using the following primers (Table 1) at a concentration of 10 µmol / 10 ng of cDNA. Set the PCR as follows: denature DNA at 95 °C for 5 min, amplify with 35 cycles at 95 °C for 15 sec, 60 °C for 30 sec, 72 °C for 1 min, followed by a final cycle at 72 °C for 10 min. Run the PCR product on a 1% Agarose gel. Wash the EBs with PBS two times at RT. Fix the EBs at RT in 4% paraformaldehyde for 10 min. Rinse once with PBS at RT. Store samples in PBS at 4 °C until used for staining. On staining day, treat the fixed cells with fixation and permeabilization reagents. Incubate the samples with blocking solution (10% goat serum in permeabilization solution) for 1 hr at RT. Perform immunochemistry in 10% goat serum in permeabilization solution using the following primary antibodies at the indicated dilutions:anti-Pax6 (1:10), anti-RX (1:200), anti-MITF (1:30), and anti-ZO1 (1:100). Incubate samples with corresponding antibodies O/N at 4 °C. Next day, remove the primary antibody from the cells and rinse the samples three times with PBS. Incubate samples with fluorophore-conjugated secondary antibodies for 1 hr at RT. Remove the secondary antibody from the cells and rinse the samples three times in PBS. Mount the cover slips on glass slides with DAPI containing mounting medium and allow samples to set O/N in a dark chamber. Use a fluorescence microscope to visualize the staining. Wash the cultured EBs in PBS two times. Incubate the EBs with 0.5 ml of 0.25% trypsin for 5-10 min to make a single cell suspension. Neutralize the trypsin with trypsin neutralizing solution (1 ml/well). Transfer the single cell suspension to a 15 ml conical tube and centrifuge at 600 x g for 10 min. Discard the supernatant and add 10 ml of DMEM/F12 to the cells in the tube. Gently invert to mix the cells. Centrifuge at 600 x g. After centrifugation, discard the supernatant and resuspend the cells in FACS staining buffer. Count the total number of cells. Centrifuge at 600 x g for 10 min. After centrifugation discard supernatant. Fix the cells immediately by adding 0.5 ml of 4% paraformaldehyde. Mix well by gentle vortexing. Incubate the cells at 4 °C for 20 min. Centrifuge at 600 x g for 10 min and remove the supernatant. Vortex gently to disrupt the cell pellet. Permeabilize the cells by adding 1 ml of chilled permeabilization solution. Vortex gently to mix and incubate on ice for 30 min. Centrifuge at 600 x g for 10 min and remove the supernatant. Add 3 ml of FACS staining buffer and resuspend. Repeat this step for one more time. Resuspend the cells in FACS staining buffer at a final concentration of 5 x 106 cells/ml. Transfer 100 μl of the cell suspension (0.5 x 106 cells) to each microfuge tubes and add the recommended volume of primary antibody . For Pax6, add 5 µl of PE anti-Pax6 in 100 µl of cell suspension. 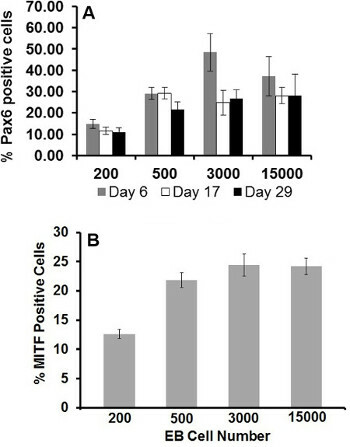 For MITF, add 5 µl of anti-MITF in 100 µl of cell suspension. Mix and incubate at RT for 60 min. Add 3 ml of FACS staining buffer. Mix and centrifuge at 600 x g for 10 min. Remove the supernatant and repeat 8.16 for two additional times. For MITF staining, incubate the cells in secondary antibody, goat anti-mouse Alexa Fluor 488 at a dilution of 1:2,000 for 1 hr at 4 °C. For Pax6 staining, avoid this step. Wash the cells with 5 ml of FACS staining buffer and centrifuge at 600 x g for 10 min. Repeat the process for two more times. Resuspend the cells in 500 μl of FACS staining buffer and vortex gently to disrupt the cell pellet. Samples are ready for flow cytometric analysis. At day 29, carefully cut around the selected pigmented colonies from the culture plate using a 200 µl pipette tip . Transfer the floating colonies to a 15 ml conical tube. Centrifuge the colonies at 600 x g for 10 min at RT and remove the supernatant. Resuspend the cell colonies in 10 ml of DMEM/F12 and centrifuge at 600 x g for 10 min. Remove the supernatant. Prepare a single cell suspension by incubating the colonies with 2 ml of 0.25% trypsin at 37 °C for 7-10 min. Gently vortex the cell suspension to dissociate the colonies. Neutralize the trypsin by adding 2 ml of iPS-RPE medium. Centrifuge at 600 x g for 10 min and discard the supernatant. Resuspend the single cells in 2 ml of iPS-RPE medium. Transfer the cells into a protein matrix coated 6-well plate and place in an incubator at 37 °C, 5% CO2 and 95% humidity. In this experiment, iPS cells were cultured and differentiated into the RPE lineage from EBs. EBs of controlled sizes were formed using microwell plates. As seen in Figure 1 EB formation was homogenous in the microwell plates. These EBs were then collected and plated on 6-well plates (Figure 2). RPE can be identified by their classical hexagonal morphology, pigmentation, and expression of RPE markers. After 12 weeks of culture, the 200-cell EBs had developed astrocyte and fibroblast morphology. No pigmentation was observed in these cells (Figure 3A). Larger EBs developed a monolayer of classical RPE morphology and pigmentation (Figure 3B and C) Immunocytochemistry to detect RPE markers, MITF and ZO1 revealed co-expression of these proteins that had been derived from 500-cell and 3,000-cell EBs (Figure 4). Expressions of eye field and RPE genes were monitored by PCR. Figure 5 shows the gene expression profile of neuroectodermal, eye field precursors, and RPE markers in different sizes of EBs. Importantly, the specific RPE marker, RPE65 was detected beginning at day 17. To quantify the yield of cells that had differentiated into RPE lineage, FACS analysis was performed to detect the neuroectodermal and RPE precursor markers, PAX6 and MITF respectively. Figure 6A shows neuroectodermal marker PAX6 in different sizes of EBs at different time points. Approximately 50% of the analyzed cells were positive for Pax6 on day 6 of culture in the 3,000-cell EBs. Additionally, FACS analysis of RPE marker, MITF on varied EB sizes revealed that 20% of the cells expressed MITF by Day 60 of differentiation. Cultured RPE are also characterized by their ability to lose their pigment and polygonal morphology and obtain a fibroblast phenotype upon passaging. Therefore, to determine if the iPS derived RPE possess these characteristics, we mechanically isolated and passaged the cells. 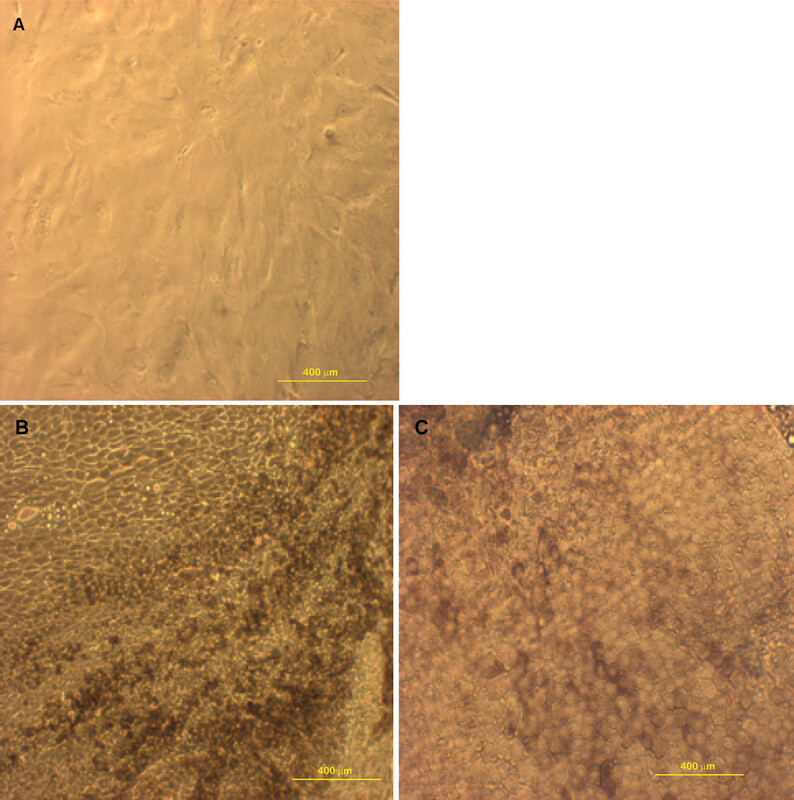 Figure 7A shows the newly passaged cells have lost pigment and gained fibroblast morphology. Additionally, these cells proliferated and regained the classical polygonal morphology upon confluence (Figure 7B). Within a few weeks, these cells regained their pigmentation (Figure 7C). Table 1. PCR primer sequences for Pax6, RPE65, RX, MITF and GAPDH genes. Figure 1. Formation of EBs with microwell plates. Each microwell contains (A) 100 cells, (B) 200 cells, (C) 500 cells, and (D) 3,000 cells. Cells were incubated 24 hr at 37 ºC and 5% CO2 for the formation of EBs. (Magnification 100X, scale bar = 400 µm). Please click here to view a larger version of this figure. Figure 2. EBs harvested from microwell plates. (A) 200-cell EB, (B) 500-cell EB, (C) 3,000-cell EB, and (D) 15,000-cell EB. (Magnification 200X, scale bar = 200 µm). Please click here to view a larger version of this figure. Figure 3. iPS-derived RPE from different sizes of EBs. EBs were cultured for 12 weeks. (A) 200-cell EBs had only developed astrocyte and fibroblast morphology without pigmentation; while 80% – 90% of the cells in the 500-cell EBs (B and C) developed a monolayer of polygonal pigmented cells. (A & B: Magnification 100X, scale bar = 400 µm; (C): Magnification 200X, scale bar = 200 µm). Please click here to view a larger version of this figure. Figure 4. Co-expression of MITF and ZO1. 500- and 3,000-cell EBs expressed MITF and ZO1 after 17 days of differentiation. (Magnification 400X, scale bar = 20 µm). Please click here to view a larger version of this figure. Figure 5. Gene expression profile of different sizes of EBs at different time points of differentiation. Please click here to view a larger version of this figure. Figure 6. FACS analysis of varied EB size for RPE differentiation. (A) FACS data of neuroectodermal marker PAX6 in different sizes of EBs during differentiation. (B) FACS analysis of RPE marker MiTF on varied EB sizes at day 60 of differentiation. The highest level of MITF reached 20% and was constant between EB size of 500, 3,000, and 15,000 cells. Figure 7. Continued culture of manually isolated RPE. (A) RPE was subcultured and acquired fibroblast morphology after passage. (B & C) Cells developed polygonal morphology and pigmentation over time. (Magnification 100X, scale bar = 400 µm). Please click here to view a larger version of this figure. To realize the full promise of pluripotent stem cells for cell therapy, it is necessary to regulate their differentiation in a consistent and reproducible way. This report describes protocols to form size-controlled EBs using microwell plate technology, initiate differentiation toward RPE and identify protein and gene markers of RPE. To synchronize the in vitro differentiation, homogenous sizes of EBs were formed by known numbers of iPS cells centrifuged in microwell plates by forced aggregation. Immunocytochemistry and reverse-transcription polymerase chain reaction (RT-PCR) are used to monitor the expressions RPE proteins and genes of explained. Finally, the efficiency of differentiation in different sizes of EBs was analyzed by FACS analysis. These techniques can facilitate the differentiation of iPS cells into RPE for future applications. There are several crucial points in this method that must be carefully executed to ensure the success of this protocol and attainment of accurate data. The first key step occurs during the iPS cell culture. iPS cells must be maintained in a pluripotent state to maintain their stemness. The cells must have the medium changed daily in order to maintain appropriate levels of bFGF and be carefully inspected daily for signs of differentiation. Undifferentiated iPS cells grow as compact multicellular colonies. The cells should have a high nuclear to cytoplasm ratio and prominent nucleoli. The iPS colonies are characterized by a distinct border, with several layers of cells at the center. Signs of differentiation include loss of defined colony borders, non-uniform cell morphology, and the appearance of obvious cell types, such as neurons and fibroblasts. Single cells that have differentiated can be removed by dispase and rinsing, however, colonies with these characteristics must be manually removed from the culture22. Preparation of a single iPS cell suspension for forming the EBs is the next critical step. It is important to prepare a suspension without cell aggregates in order to accurately deliver the desired number of cells to the microwell plate and prepare the desired size EB. RNA preparations for PCR analysis are also important. Inconsistent RNA quality is a significant source of variability in PCR data. RNA extraction should yield minimally degraded RNA for best results. Successful RNA extraction will yield total RNA with minimal degradation and free of any contaminating RNases. After determination of the RNA concentration by spectrophotometry at 260 nm, the purity of the sample should be determined at 230 and 280 nm to detect contamination with polysaccharides or protein. The 230:260:280 ratio for RNA should be 1:2:1 to indicate high quality RNA with no contamination23 . Finally, it is important to adequately fix the cells for FACS staining. During this fixation step, the cells must be separated to prevent clumping. Insufficient cell resuspension prior to permeabilization will lead to cell clumping and inaccurate staining. We recommend that the protocol be followed as described, however a few modifications can be made if necessary. During the generation of EBs described in Step 4, the number of cells per EB can range between 500 to 3,000 to achieve a high yield of cells differentiated into RPE. If the number of iPS cells is limited, 500-cell EBs will produce RPE comparable to the 3,000-cell EBs. Extra care must be taken during the RNA extraction process described in Step 6. Samples should be run in triplicate to ensure that high quality RNA can be acquired. During immunocytochemistry as described in Step 7, the primary and secondary antibody concentrations can be adjusted as necessary to improve signal intensity and reduce background. The appropriate positive and negative controls should be included in the assay. During Step 8, FACS analysis, if the expected results are not acquired after staining, a small sample of the stained cells can be placed on a slide and viewed with a microscope to visualize staining. The appropriate positive and negative controls should be included in the assay. If the cells are not stained as expected, the antibody concentrations can be increased or decreased as needed. The technique described in this report will result in a higher yield of RPE than spontaneous differentiation, without the use of added chemicals. However, the main limitation of this approach is that there will also be a large number of non-RPE cells generated. Therefore, the RPE must be carefully selected out and enriched as described in Step 9 to ensure a homogenous population. The significance of this approach is that a higher yield of RPE can be derived from iPS cells than spontaneous differentiation techniques. The use of small molecules to derive RPE from iPS has also been reported to give a high yield of differentiated cells, however, that technique is much more complex and requires the timing and concentrations of the small molecules to be optimized to achieve the desired results 7,10. In addition, the small molecules used in those methods have pleiotropic effects which can confound the results. The described method can be used to make EBs of desired sizes with high reproducibility. 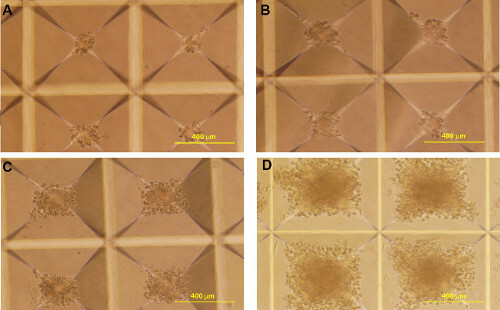 This technique generated EBs of uniform sizes which were used to optimize the differentiation of iPS cells towards the RPE lineage without the use of additional chemicals. The iPS-RPE cells derived from EBs can then be further used in transplantation studies to confirm their integration into the retina in a functional organization. These cells can also provide a good research model to study the pathogenesis of various RPE diseases in vitro. The utility of this approach can be applied to the directed differentiation into many other cell types, depending upon the size of the EBs and the in vivo origin of the cell in the blastocyst. Cells of the ectoderm will give rise to neurons, epidermis, hair and mammary gland cells; endoderm will give rise to stomach, colon, lungs, and intestinal cells; mesoderm will give rise to skeletal muscle, heart, kidney, and connective tissue cells 3,11,19. Once the correct EB size has been determined, the differentiated cells need only to be analyzed by immunocytochemistry or FACS for the correct expression of marker proteins. The opinions or assertions contained herein are the private views of the authors and are not to be construed as official or as reflecting the views of the Department of the Army or the Department of Defense. This research was performed while the authors Alberto Muñiz, Ramesh R Kaini, Whitney A Greene and Jae-Hyek Choi held a National Research Council Postdoctoral Research Associateship at the USAISR. This work was supported by U.S. Army Clinical Rehabilitative Medicine Research Program (CRMRP) and Military Operational Medicine Research Program (MOMRP). Takahashi, K., et al. Induction of pluripotent stem cells from fibroblast cultures. Nat Protoc. 2, (12), 3081-3089 (2007). Reubinoff, B. E., et al. 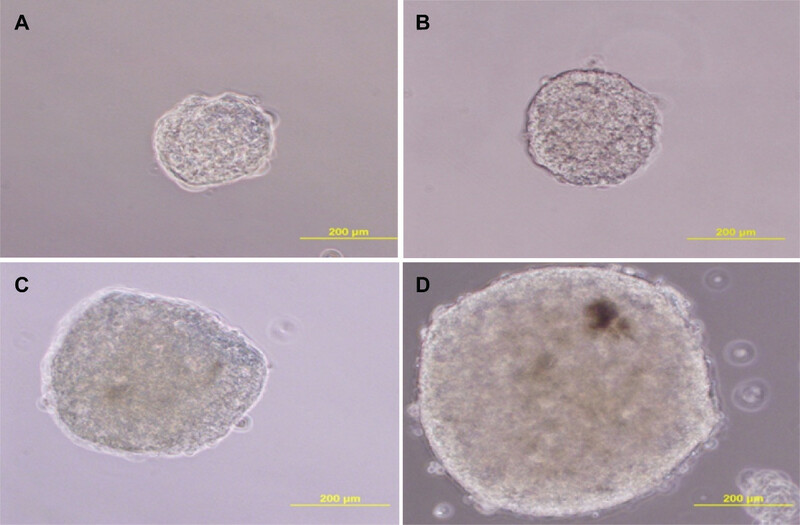 Embryonic stem cell lines from human blastocysts: somatic differentiation in vitro. Nat Biotechnol. 18, (4), 399-404 (2000). Thomson, J. A., et al. 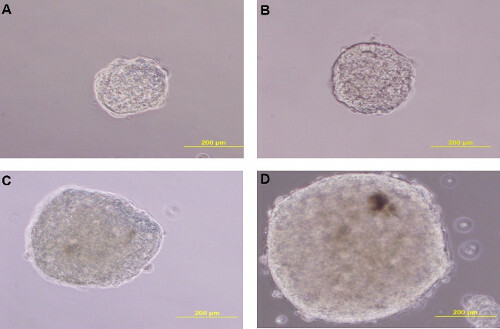 Embryonic stem cell lines derived from human blastocysts. Science. 282, (5391), 1145-1147 (1998). Buchholz, D. E., et al. Derivation of functional retinal pigmented epithelium from induced pluripotent stem cells. Stem Cells. 27, (10), 2427-2434 (2009). Ukrohne, T. U., et al. Generation of retinal pigment epithelial cells from small molecules and OCT4 reprogrammed human induced pluripotent stem cells. Stem Cells Transl Med. 1, (2), 96-109 (2012). Subba, R. M., Sasikala, M., Nageshwar, R. D. Thinking outside the liver: induced pluripotent stem cells for hepatic applications. World J Gastroenterol. 19, (22), 3385-3396 (2013). Yoshida, Y., Yamanaka, S. iPS cells: a source of cardiac regeneration. J Mol Cell Cardiol. 50, (2), 327-332 (2011). Mak, S. K., et al. Small molecules greatly improve conversion of human-induced pluripotent stem cells to the neuronal lineage. Stem Cells Int. 2012, 140427 (2012). Cour la, M., Tezel, T. The Retinal Pigment Epithelium. Advances in Organ Biology. 10, 253-273 (2006). Vaajassari, V., et al. Toward the defined and xeno-free differentiation of functional human pluripotent stem cell-derived retinal pigment epithelial cells. Mol Vis. 17, 558-575 (2011). Carr, A. J., et al. Protective effects of human iPS-derived retinal pigment epithelium cell transplantation in the retinal dystrophic rat. PLoS One. 4, (12), e8152 (2009). Muniz, A., et al. Retinoid uptake, processing, and secretion in human iPS-RPE support the visual cycle. Invest Ophthalmol Vis Sci. 55, (1), 198-209 (2014). Meyer, J. S., et al. Modeling early retinal development with human embryonic and induced pluripotent stem cells. Proc Natl Acad Sci U S A. 106, (39), 16698-16703 (2009). Bratt-Leal, A. M., Carpenedo, R. L., McDevitt, T. C. Engineering the embryoid body microenvironment to direct embryonic stem cell differentiation. Biotechnol Prog. 25, (1), 43-51 (2009). Kurosawa, H. Methods for inducing embryoid body formation: in vitro differentiation system of embryonic stem cells. J Biosci Bioeng. 103, (5), 389-398 (2007). Ng, E. S., et al. Forced aggregation of defined numbers of human embryonic stem cells into embryoid bodies fosters robust, reproducible hematopoietic differentiation. Blood. 106, (5), 1601-1603 (2005). Maminishkis, A., et al. Confluent monolayers of cultured human fetal retinal pigment epithelium exhibit morphology and physiology of native tissue. Invest Ophthalmol Vis Sci. 47, (8), 3612-3624 (2006). Maintenance of hESCs and hiPSCs. mTESR1 and mTESR2. Stem Cell Technologies. Available from: http://www.stemcell.com (2010). The Analysis of DNA or RNA using its wavelengths: 230 nm. 260 nm. 280nm.. About Biotechnology. 230, Available from: http://archive.today/0qTh (2013).